Fully equipped, battery-operated BR 45/22 C Bp scrubber drier is the ideal choice for cleaning large areas with narrow and hard to reach areas. 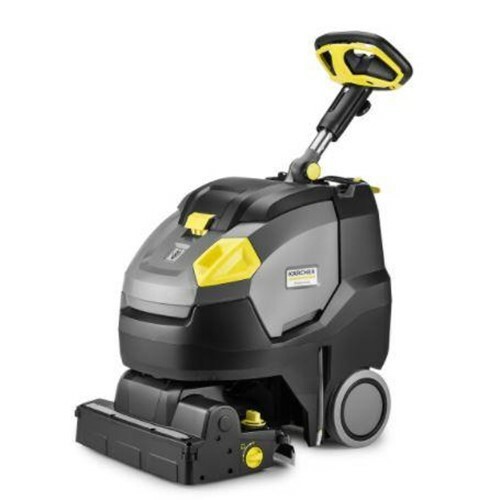 Equipped with a roller brush head and KART technology (Karcher Advanced Response Technology) that is rotatable by 200 degrees in both directions and a large 18-inch working width. The position of the brush and squeegees, which is continuously transverse to the direction of travel, provides increased area performance and a uniform cleaning result. The built-in, maintenance-free, high-power lithium-ion batteries offer a lifetime up to three times longer than that of conventional lead batteries. Using Eco efficiency mode users can increase their run time significantly and reduce the operating noise by 40 percent. The optional HEPA filter filters the exhaust air from the dirty water, allowing you to work in hygiene-sensitive areas. The big brother to our popular BR 35/12, our BR 45/22 brings even more productivity to our innovative steerable scrubber design. This machine has a larger tank and an 18 inch cleaning path that equates to a 30 percent improvement in productivity over the BR 35/12. It is easy to transport and handle, and features a long-lasting lithium-ion battery.